A couple of years back, blog friend Maddy aka Madhavan, who dates back to the time I started blogging in 2006, called to say that he’d be coming to meet me. This was going to be our first face-to-face meeting though believe it or not, he had already met the L & M (who was at the time working in a different city), the year before, when Maddy made time to visit him at his office and leave a couple of books as gifts for me. It turned out he hadn’t. So we insisted he have some. 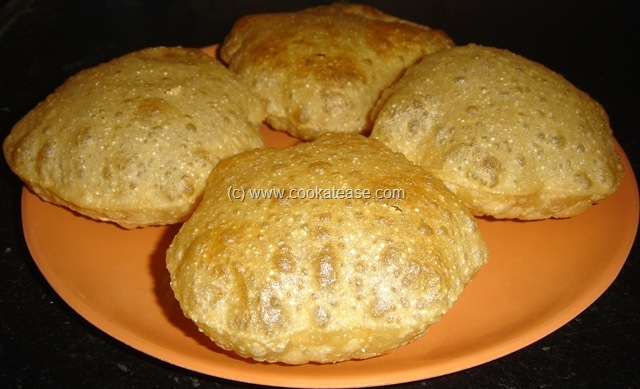 We had pooris for breakfast that morning. But the potato sabzi had hit the bottom. So rustling up ande ki bhujia seemed the best bet since Maddy had plans to meet yet another friend by lunchtime. “No, I don’t,” he replied, shaking his head. “But, I asked you earlier and you said, yes!” I replied amazed. “What did you think Ande ki bhujia is made of? !” Now I was amused. Poor man Maddy, he wasn’t familiar with Hindi. And as for me, I was under the impression that ande ki bhujia is universal language, well if not universal, at least one spoken by all of India. I mean, is there anyone who doesn’t know anda is egg? Apparently there are quite a few and Maddy heads the list (Just pulling your leg, Maddy!). 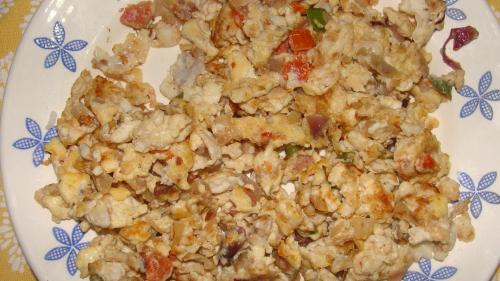 For the still clueless, ande ki bhujia is nothing else but the humble scrambled eggs, Indian style. The guest was apologetic about the fiasco, the Colonel was even more apologetic, while I couldn’t stop laughing. Anyway remedial measures had to be initiated right away. The ande ki bhujia was whisked back to the kitchen. What was left of the morning’s potato sabzi was scraped off the bottom of the dish and put into a more flattering smaller one, a pickle bottle was added to the setting with a flourish. I don’t remember what else, but I think there was some leftover vegetable curry from the fridge that also made it to the table that day. But what I most definitely remember is Maddy thinking ande ki bhujia was some sort of veggie dish. Here is a picture from that day. That’s Maddy standing behind us. Hahaha!!! Oh! I am so going to pull his leg on this. Even I would have been confused at the ‘bhujia’ because we call it ‘bhurjee’. I can recall a similar event but this is a comment and not blog section…so later..
Arre, but you know what an anda is 🙂 Bhurjee, bhujiya/bhujia are only descriptions as to what’s done to the anda! And I am all ears for the similar event! Bolo, bolo. I won’t mind the ande ki bhujiya! I seriously wont! and please not to assume anytime that I will come having eaten… please to be ready to feed…whatever you cook! Lol poor guy! And you having to scrape your kitchen for a decent breakfast for him! Yeah, even I would have assumed ‘anda’ is well understood. Shail, you must sing “Ande ka Funda” song for him! I shook my head up and down on that day when you asked if I would have breakfast, because……. Do you remember I called you from Ochira? I was travelling all the way to Trivandrum that evening and reached half past 10 without dinner. Next morning, I got up early and visited Padmanabhaswamy temple, Pazhavangadi and Attukal. In between coordinating with another blogger ( Dr.Nina) to meet her at your residence and no time for breakfast. I was hungry when I reached your home and when you asked, it was a blessing in disguise!!!!. So “Anda” did not strike me. Also blame it on Tamilnadu dravidan Politics for not learning Hindi and all my workplace and construction sites were in Tamilnadu until I moved to Gulf. While I was working in Coonoor I picked a bit of Malayalam, because our painters were from Trivandrum and two of them not even tried to speak in Tamil. Thanks to them for my early learning of Malayalam. Good memories. I can’t stop laughing at myself reading this post. Good memories indeed and thanks for jogging it out which is why it has been written about now. and proclaiming that he ate andae daily. This made me smile. I’m slowly learning Hindi but never fail to be amazed how easy it is after learning Bengali because so many words are very similar at least in terms of consonants sounds even if the vowels are altered. The alphabets are similarly clearly related (presumably through sanskrit). I wouldn’t have known ande was ‘egg’ either. In Bengali it would be ‘dim bhaji’ – but then if I came to your house it wouldn’t matter because I love to eat eggs, or anything!